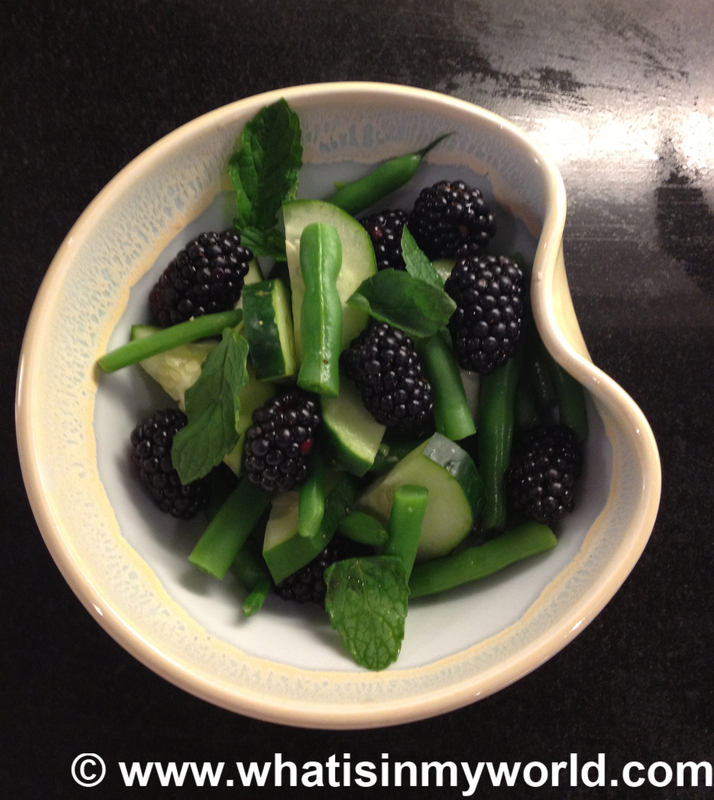 Green Bean, Cucumber, Blackberries and Mint salad. After my post last week on watermelon salad, I came across a recipe for a salad by Joseph Lenn. As you know, I am an enormous fan of the Wall Street Journal weekend edition. It is one of the best gifts I have ever been given. The “Off Duty” section covers everything : fashion, art, travel, design, food and wines. If you are not a WSJ Saturday reader I highly suggest you try it. Last weeks edition of the weekly column “Slow Fast Food”, highlights Joseph who is the chef at The Barn at Blackberry Farm in Walland, Tennessee. He created a salad using green beans, cucumbers, blackberries and mint. These are not four ingredients I would have thought to put together. The salad is not only beautiful but delicious as well. The dressing is a aioli thinned with a puree of cucumber and lime juice. It is easy to make and is a refreshing combination of ingredients. Click this link for the recipe. If you are wondering about the bowl pictured above, it was created by ceramic artist Sara Lerner. I am crazy about the shape and the color. You can view her collection at Parasutra Yoga Studio or by visiting her website. Have you dined at Blackberry Farm before? It is certainly on my list next time I am in the area. Just wrote down the recipe. Sounds like an interesting combination of flavors. Can’t wait to try it!